Terumah: What can we give You? and all that lie between are Yours? in the crucible of a willing heart. into a tapestry of grace. the essence of Your design. The Etz Hayim commentary of the JPS points out on the phrase, “I may dwell among them,” that God’s presence is not found in a building but in the hearts and souls of those who fashion and sanctify it. *The Torah commentary of the Sefat Emet translated and interpreted by Rabbi Arthur Green. to receive the word of God. like a fire too hot to approach. there God will come to meet us. Rabbi Meir Simcha HaKohen of Dvinsk* taught that Mount Sinai possessed no intrinsic holiness, nor acquired it by virtue of the theophany: the mountain was a place where God and human beings reached out to each other. The people were warned to stay away from the mountain before the giving of the Torah and afterwards they and their flocks could go up on the mountain again (Shemot 19:12-13). The Etz Hayim commentary of the JPS reflects on this verse that feeling God’s presence is not limited to Mount Sinai. Wherever we invoke God’s name, God promises to be with us and bless us. Spirituality, we learn, is not confined to any particular place. *Rabbi Meir Simcha ha-Kohen of Dvinsk (1843–1926) was a rabbi and prominent leader of Orthodox Judaism in Eastern Europe in the early 20th century. He is known for his writings on Maimonides’ Mishneh Torah, which he called Ohr Samayach, as well as his novellae on the Torah, entitled Meshech Chochma. R’ Meir Simcha was born in Butrimonys Lithuania, to Samson Kalonymus, a local wealthy merchant. Educated locally he somehow was able to evade the perodic roundups of Jewish boys. At age 17 he married and settled in Białystok, Poland, where he was supported by his wife, who opened a business to support him while he continued his Talmudic studies. After 23 years, and after refusing many offers, he accepted the rabbinate of the mitnagdim (non-hasidic Jews) in the Latvian town of Dvinsk, now known as Daugavpils. There he received visitors from the whole region, and was frequently consulted on issues affecting the wider community in Poland and Lithuania. He served in that position for 39 years until his death. In Dvinsk, his counterpart was the hasidic Rabbi Yosef Rosen, known as the Rogatchover Gaon. The two had a great respect for each other, despite Rosen’s legendary fiery temper, and on occasions referred questions in Jewish law to each other. They also shared a love for the works of Maimonides. Yitro: Who Stood at Sinai? Caucasian; no strangers; no converts? neurotypical and sound of mind? met the Divine at Sinai. The Torah tells us in this verse that all the people were present at the revelation at Sinai. Later, when Moses recalls the revelation and repeats the Decalogue, the Torah again speaks of the entire people being present, “Moses summoned all the Israelites and said to them, “Hear O Israel…” (Devarim 5:1). *Rabbi Israel Yitzhak Kalish of Vurka (1779–1848) was the first rebbe of Vurka in central Poland. In 1829 he moved to Przysucha where he became a disciple of Rabbi Simcha Bunim of Przysucha, among whose other notable followers were Rabbi Menachem Mendel of Kotzk (Kotsker Rebbe), Rabbi Yitzchak Myer Alter of Ger (Chidushei Harim), Rabbi Mordechai Yosef Leiner of Izhbitz (Mei HaShiloach), Rabbi Yaakov Arye of Radzymin and Rav Chanoch Heynekh of Alexander. Eventually Rabbi Yitzhak settled in Vurka where the dynasty was founded. Whereas the Kotsker Rebbe’s outlook was a pessimistic one reflecting a belief that the fate of the world is a dark one and almost superhuman powers are required to overcome obstacles, the Vurker Rebbe’s outlook was just the opposite. He believed that the original source of the world is a great love, and evil is a mere lapse in a peaceful world harmony. His love for all people was proverbial and the Kotsker said of him that even in heaven, the Vurker would find a place for everybody. (from Poyln: My Life Within Jewish Life in Poland : Sketches and Images vol 1 (2007) by Yeḥiel Yeshaia Trunk – a descendant of the Vurker Rebbe). battened down against the wind. interspersed with cold and rain. a profusion against the azure sky. – put forth your flowers. our foes in relentless pursuit. we are caught in a merciless trap. awe-struck we tread on dry land. we forge our way through it to serve. On the phrase, “Hashem yilachem lachem ve’atem tacharishun – the Lord will battle for you; you hold your peace!” Rabbi Meir of Premishlan* makes a play on the words yilachem and tacharishun. He says, “Although God is the One Who gives bread to all living (yilachem from the word for lechem) never-the-less you have to work and to plough (tacharishun shares the root letters of lacharosh). In a commentary on parashat Beshalach entitled Nothing is Unchangeable, Rabbi Elliot Kukla notes that the splitting of the sea was a critical moment in Jewish history. He points out that we tell and retell this narrative in prayer more frequently than that of the creation or the giving of the Torah. He asks why we need to hear this story so often. Rabbi Kukla suggests it is because it reminds us that nothing is immutable. If we saw that seas can split, then it opens up possibilities that barriers can be overcome and new and unimagined horizons can appear. He envisages the eradication of disease and poverty which currently seem unattainable goals. *Rabbi Meir the Second of Premishlan (1783–1850) was the most famous rabbi of the dynasty which was founded by his grandfather Rabbi Meir Hagadol of Premishlan (1703–1773) who was a disciple of the Baal Shem Tov. R’ Meir the Second was widely known as a miracle worker. He lived in abject poverty, yet exerted himself tirelessly for the needy and the suffering. He wrote no works, but some of his teachings were collected and published by his Chassidim after his death. 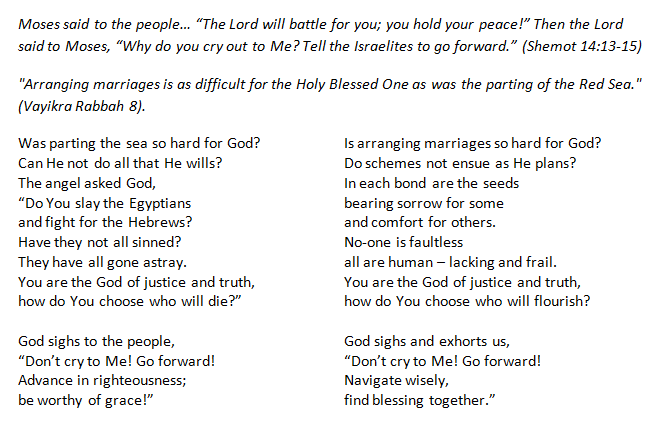 In a beautiful blogpost on parashat Beshalach http://www.rebjeff.com/1/post/2012/01/beshalach-the-red-sea-and-your-marriage.html Rabbi Jeffrey Goldwasser cites the well-known midrash which says, “Arranging marriages is as difficult for the Holy Blessed One as was the parting of the Red Sea.” (Vayikra Rabbah 8). Rabbi Goldwasser brings the question raised about this midrash in the Zohar which asks, “Was parting the Red Sea so difficult for God? Is it not true that as soon as God is resolved to do something, all obstacles are as nothing? How was it that the dividing of the Red Sea was difficult for God?” (Zohar II 170a). The Zohar answers that God’s “difficulty” lay not, of course, in the splitting of the sea. His quandary was how to choose the lives of the Children of Israel over those of the Egyptians. The Zohar quotes the angel of the Egyptians addressing God before the Egyptians were drowned in the sea. The angel challenges God, asking Him why He is punishing Egypt and saving the Israelites. He asserts that they are all sinners. He questions how a God of truth and justice chooses between the two peoples. At that moment, the Zohar tells us, God is faced with a harrowing dilemma which is the real difficulty of the parting of the Red Sea. Reb Jeff says, “That is what is missing from the story — the way that God struggles over the fate of one imperfect people over another. None is without faults, yet some must flourish while others perish. God makes choices where there are no good choices, and God agonizes over it. Who will live and who will die? How can God make choices if human beings will not “go advance” in their choices? © Elizabeth Topper and Parasha Poems, 2012-2016. Unauthorized use and/or duplication of this material without express and written permission from this blog’s author and/or owner is strictly prohibited. Excerpts and links may be used, provided that full and clear credit is given to Elizabeth Topper and Parasha Poems with appropriate and specific direction to the original content.